A perfect book for our generation of teenagers! No technology at the dinner table. Is that on? Shut it off, please. Sound familiar? We live in a very technological world. Texting and driving recently surpassed drinking and driving as the cause for fatal driving incidents, proving that people are more connected, more wired in than ever. It’s a whole new world, and it’s not going anywhere. Thankfully, author Kirt Manecke realizes that rather than trying to pretend that our wired world doesn’t exist, it’s much better to teach teens how to succeed in such an environment. 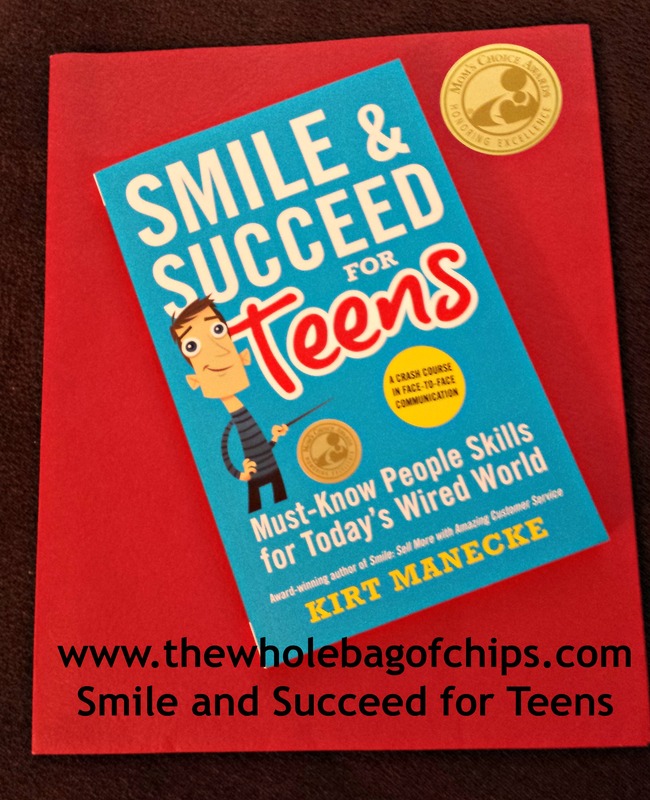 Manecke’s book, “Smile & Succeed for Teens” has received the “Mom’s Choice Award,” which is something I often look for when I’m considering a product for my kids. The book, geared for kids ages 12 and up is a spinoff from Manecke’s adult book, “Smile: Sell More with Amazing Customer Service.” It is a handbook of sorts, helping kids to make the best possible first impression when they’re out in the world. It’s designed to be read in any order, either chapter by chapter or topic by topic, and the first chapter alone, “The Top Ten People Skills,” is invaluable in itself, teaching kids how to do the most basic of skills: making good eye contact, putting away their devices, using manners, and all of the things we sometimes forget that kids aren’t born knowing how to do. We teach them other basic life skills, but these types of skills also must be taught. We also need to remember that technology is good sometimes, but not all of the time, and we as adults must model good people skills too, putting our devices away, using good body language and eye contact as well. You can read a section of it here. Upon reading the book myself, I told my 15 year old daughter that I was insisting that she read it too, and my 12 year old is on deck as well. I firmly believe that every teen should read “Smile & Succeed for Teens.” The language and drawings are humorous and kid-friendly, and sometimes, hearing the things mentioned in this book from someone other than your parents sounds better, and so much more enlightening than when you hear it from your parents. Again. And again. The other thing that I loved about this book was the title and topics featured in Chapter Seven: Use Your Expertise and People Skills to Change the World. This is something that we have tried to instill in our children from a very young age: making a difference, changing the world, rocking the world. I read that Kirt Manecke volunteers his own time, working with DECA to help teens be successful, and also helping with environmental causes and working to end cruelty. He’s leading by example and he talks about how to make a difference in the world in Chapter Seven, and I love that. In fact, a percentage of every book sold goes to animal welfare. The book can be ordered online and I strongly encourage everyone- parents, teachers and teens- to check it out. It’s a great book to teach all teens the most basic social skills needed for a lifetime of success in any world, but especially in today’s wired world. Reblogged this on Consumer Reports Blog. This is very interesting, and yet I’m of two minds about it (not having read the book, so obviously my opinion should be taken with a grain of salt!). On the one hand, any tool that helps parents with such practical advice for kids is a good thing. On the other hand, the kids who are likely to benefit most from such a book are a) exponentially unlikely to get a copy in their hands or read it even if they do and/or b) exponentially unable to internalize good advice like this.My guess is that kids whose parents are on the ball enough to get this book for their kids are not the parents whose kids need it the most. It’s really a conundrum.